When I left the How Design Conference in Chicago I was determined not to let the design inspiration high that I was feeling vanish into thin air. How do I hold on to that exciting feeling in the pit of my stomach?? You know, the one where you simply cannot wait to get started on a project and have so many ideas whirling around in your head that you don’t know what to do with them all? Well, its easier said than done but I decided I would start with a letter. A letter? Yes, and that letter is R! You see, the fabulous Jessica Hische of Daily Drop Cap had a little talk at our conference and I left wondering if I could do what she does. Now obviously I am by no means saying that I have done what she does. I mean, she’s pretty freakin awesome and all of her lettering creations are perfection. But, I did it. I accomplished a little design feat by taking on a challenge and creating something. 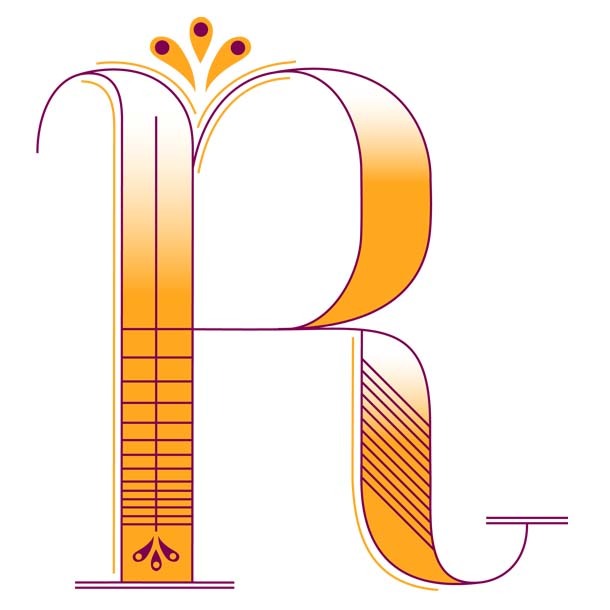 I’m quite happy with my little letter R and I hope you like it too! your "R" is AWESOME! great job! love the color combo too!